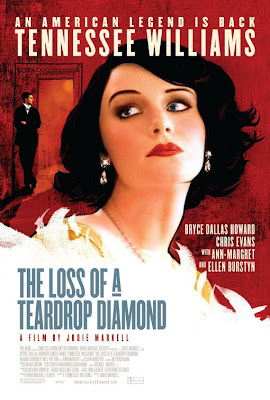 The Loss Of A Teardrop Diamond is a new drama based on a recently rediscovered original screenplay by legendary writer Tennessee Williams. Starring Bryce Dallas Howard and Chris Evans, the Paladin release will open in New York and Los Angeles in late December, with expansion to major markets following in early 2010. Academy Award-winner Ellen Burstyn, Academy Award-nominee Ann-Margret, Mamie Gummer, and Will Patton co-star in the film which was directed by award-winning short filmmaker and actress Jodie Markell, in her feature film debut. Happy new year 2010. Success for you. I hope this is nice...always been a fan of Tennessee and Ellen B. does not hurt. your website is excellent, thanks for the information.